Olympic Gold Medallist Jonathan Edwards, Mayor Norma Redfearn and Phil Gray, Total Racing International, launch this years Whitley Bay to Newcastle Half-Marathon which will take place on Sunday, October 29. Runners are on their marks for the return of a popular half-marathon. World record holder and Olympic gold medallist Jonathan Edwards CBE teamed up with Mayor Norma Redfearn and race organisers to officially launch the build-up to the Whitley Bay to Newcastle run. The annual half-marathon, launched last year by Total Racing International, starts at Spanish City before passing Tynemouth Priory, North Shields Fish Quay and Segedunum to follow the river to its finish at Newcastle Quayside. It will take place on Sunday, October 29, and is suitable for charity fun runners and serious club runners. The half-marathon will again form part of the Morpeth to Newcastle marathon race day celebrations held on the same day. Phil Gray, managing director of Total Racing International, said: “We had some amazing feedback from last year’s participants and third parties and we have been working with North Tyneside, Northumberland and Newcastle councils to ensure the race can again take place this year. 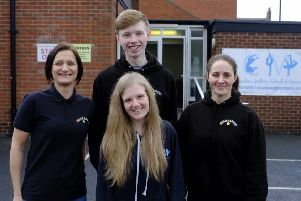 Mrs Redfearn said: “We have a long tradition of hosting road races and sporting events here in North Tyneside, and this half-marathon is another one that we are more than happy to support.